Issue #6 of Operation Three-Legged Dolphin has been uploaded to our online distributor at Issuu and is currently being published at Rainbow Printing for magazine distribution. 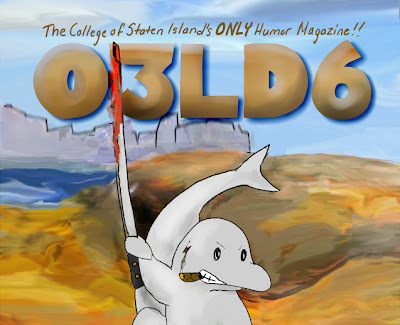 This issue features the official debut of the staff-made spin-off series: O3LD: The New Adventures, which depicts the dolphin in all his glory trying to survive on the College of Staten Island's madhouse of a campus! Each episode of this series will be published over the course of an entire school year, with a half an episode in each issue of the magazine. In this episode: It's been two years since the dolphin has defeated the treacherous Palin Beast at the CSI Smoke Tower. In these two years, he has taken refuge at the campus, keeping students safe from the weird creatures as well as the local threats that have been making their lives a living hell. His latest adversaries come in the form of a group of trolls who are out to kidnap the professors of the Math department, mimic their identities and brainwash the students into following their orders. What do they want? Why are they here? Where did they come from? The answer may shock you in this episode of O3LD: The New Adventures!